Bryon Fear talks to musician Emily Capell about her early musical influences, cheesy ’80s pop and one song that lead to a series of appearances on the gay cabaret scene. A few months ago I was invited to an album launch in the heart of London’s Soho. It was a strange gig where the headliner’s friends chose to talk all the way through the event. The evening was rescued by the petite support act, whose unconventional and highly personal songs managed to draw my attention from the bar room chatter. 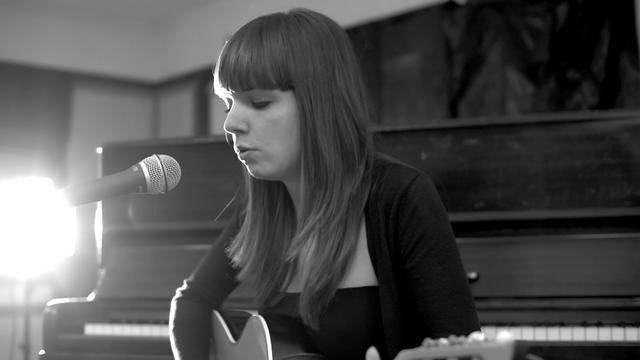 Emily Capell, armed with just an acoustic guitar, sings songs that create startling vivid vignettes that detail her life, the lives of her close friends and her family. I met with Emily in the café on the first floor of Foyles bookshop in London, and as we made our way to our table she talked about her early memories of music and how they had informed her musically. You mention The Clash as an influence, which I find interesting, as you are very young. Would you say that music was an important factor in your life when you were growing up? Yeah, I remember my dad went to Glastonbury in 1996, the year when Pulp headlined, it was supposed to be the Stone Roses, but it was Pulp, and I watched it on the telly trying to find my dad in the crowd … that whole weekend imprinted on my brain and I really got into Brit Pop. How old were you in ’96? I was four. I remember watching Blur on the NME stage. At the time all my friends liked The Spice Girls, but I was listening to Pulp, Suede and Elastica. I think our early music influences are very much passed down to us by our parents. Yeah … my brother is named Joe, after Joe Strummer. My mum liked punk but my dad was a mod and then he turned indie and began listening to bands like The Smiths. 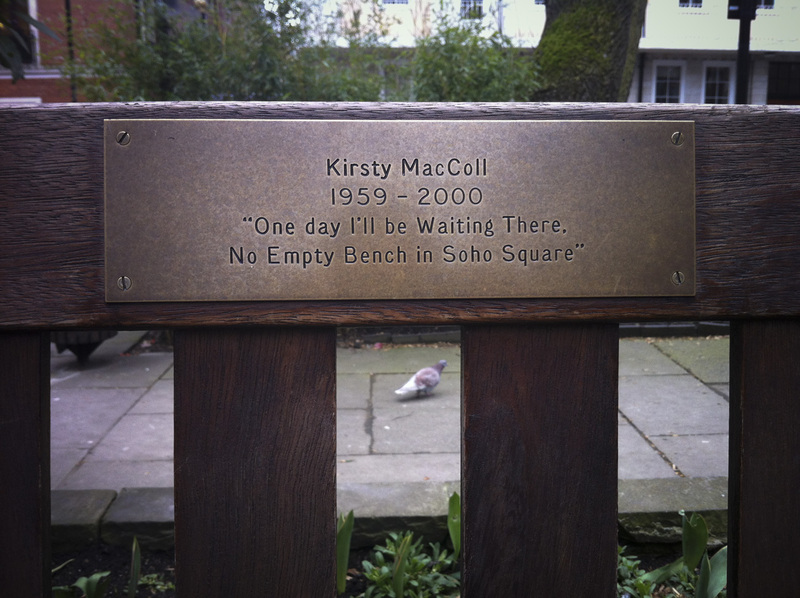 I really like Billy Bragg and also Kirsty MacColl – in fact, just before I came here to meet you, I went to Soho Square where she has a bench, so I went and like … stood near it. (She laughs.) But at the moment I’m really into Phil Spector and that ‘60s sound. I like the Ronnettes and the Crystals – they’re very cool. So at what age did you start playing the guitar? Eleven. But I was really into Wham at the time … (She rolls her eyes and laughs again.) I know! I just named all these really cool bands and now I’m talking about Wham! I had just started at secondary school and my guitar teacher wanted to know what music I liked and I wanted to play all of these cheesy ‘80s bands like Haircut 100, and my teacher asked, “don’t you want to learn ‘3000’ by Busted?” and I said, “no, I want to learn Aztec Camera”. But going back to Joe Strummer, he only ever strummed the guitar, he never learnt any scales, so I wanted to do that as well, so I ended up not really learning the guitar, only the chords. It was only when I went to college that I was made to learn scales etc. And when did you stop playing other people’s songs and start to compose music yourself? Pretty much straight away. I wanted to go out and gig and there was an open mic night at the bottom of my road, and I did that within the first six months of learning the guitar, although I learnt some Jonny Cash covers I have to say. And when you perform live now, do you ever want to play other people’s songs, or are you more focussed on playing your own material? I have one cover I do, ‘Hit the Road Jack’ that has ‘Fever’ in it. But I prefer to perform my own stuff and if people really listen it’s nice to see their reaction to your songs. You’re playing this week at Amy Lamé’s Smithsfest at the ICA. You have performed at Duckie as well. How did that connection come about? This is a ridiculous story. Amy Lamé used to do the Danny Baker Show and one day they had a “Who’s better. Morrissey or Paul Weller?” debate. Amy was obviously for Morrissey. Anyway, my dad phoned up the show and this Paul Weller fan said to him, “you’re probably a student who sits in your room listening to Morrissey records and getting depressed” and my dad said, “no, I really am a Smiths fan, I’m such a big Smiths fan that my daughter has written a song about it,” and he told Amy to look it up on YouTube … and she did! I was really, really scared. And Kevin Rowland from Dexys Midnight Runners was there, who I had bought dungarees to be like! (She rolls her eyes again with a characteristic air of self-mocking.) Imagine that! Wearing dungarees in 2001 so you can be like Dexys Midnight Runners!! (We both laugh.) And then I played Duckie, and Met Simon Strange and everybody, and my dad was there – they loved my dad, which was weird! And when Amy did her tour of Unhappy Birthday, which is about the Smiths, she used ‘My Dad’s a Smith Fan’ … and now she’s asked me to do Smithfest. Yeah. Really random … all because my dad phoned up the radio show. And on the subject of your dad, or rather that song, it seems to me that your material is very idiosyncratic and quite specific to your world and the people you know, would it be fair to say that’s where your inspiration comes from? Your songs are really quite funny – do you find that affects the way people receive you? I think that people too often dismiss art, particularly music, which employs comedy. I know what you mean. I think of them as being more ‘tongue-in-cheek’, but don’t see myself as a comedy songwriter. 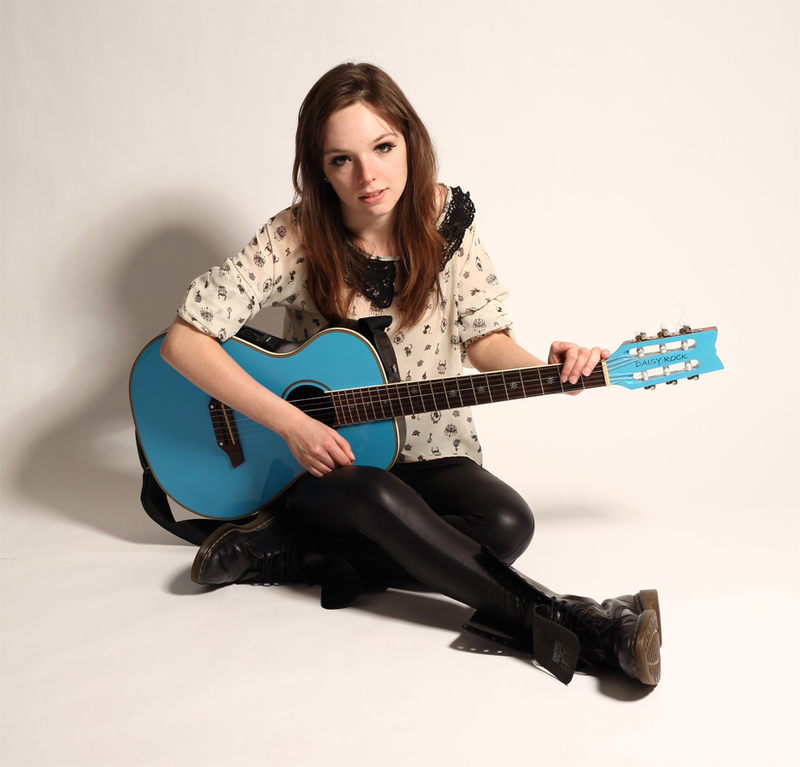 Right now it’s quite difficult to get booked for festivals when you’re a girl with an acoustic guitar and because I look really young, it’s difficult, and promoters are a nightmare for not actually listening to what you send them and just seeing the image. So, I want to start creating a bigger sound with a backing band. Do you think you would ever write as a band, or do you intend to remain the writer and have them bring the wider sound to the song? I think I would still write the songs, though – if they were good, they could – if they had something cool. A band might change your dynamic … you could meet a writing partner. Have you tried to write with someone else? You sound unsure. Not your thing? 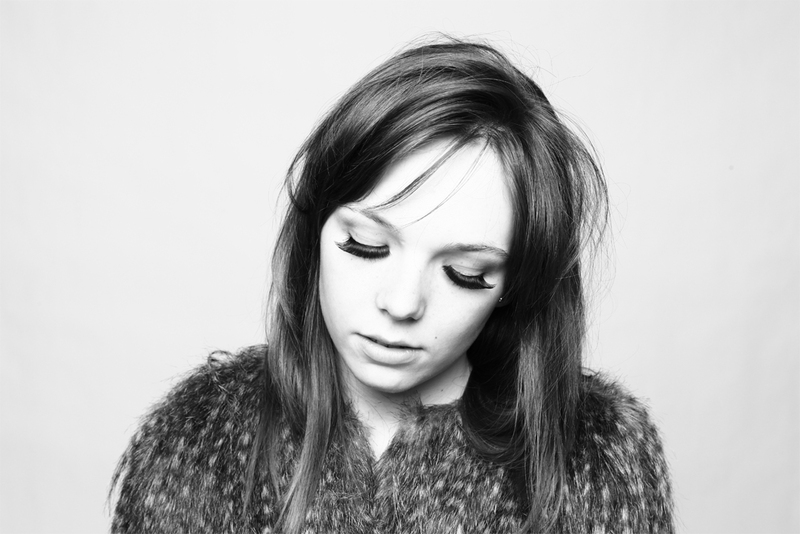 So, what’s on the horizon for Emily Capell? My EP is out, it’s called Who Killed Smiley Culture. I don’t know if you’ve heard of Smiley Culture, because nobody has heard of Smiley Culture. And I’m doing a lot of work with ‘Justice for Smiley’, they’re really cool. And are you primarily using social media to get your stuff out there? Well … I live in the past. I’m such a weirdo – I don’t really like social media, but you have to do it. I mean without it, Amy would never have found ‘My Dad’s a Smiths Fan’. So you have to do it. I hate downloading. Because of social media, you don’t make money from it. You can’t sell a CD anymore. It’s totally changed from the days of the artists I used to look up to. You can’t just go on John Peel and crack it. I would much rather hand out CDs than sending people links and emails. (She pauses, but with a smile and a twinkle in her eye concludes:) But I’ll just keep writing, and I’ll keep gigging and I’ll get my backing band … my ‘Pepsi & Shirley’! You can see Emily perform (and perhaps pick up a CD) at Smithsfest, at the ICA, Friday March 29-30.
Who Killed Smiley Culture EP is out now. Click here to Download it.